The first season will start this autumn and run from November through until March. The league will use the same nine-a-side format used in major competitions such as the Euro Cup, AFL Europe Champions League and Fitzpatrick Cup, and will run on a home and away ‘carnival’ format, so as to give teams the chance to socialise and enjoy the game together. 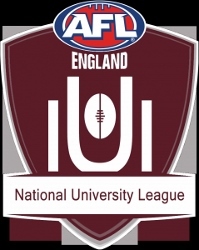 AFL England President Jason Hill said that he was pleased to finally reward the enthusiasm of the university sides and give them their own competition. “Our university teams continue to grow year-on-year. For too long they’ve had to make do with occasional friendlies with club sides from around the country, and now they have a proper league to compete against one another in. The university game is thriving, with annual men’s Varsity Game between Oxford and Cambridge in its 98th year, making it the oldest regularly played Australian rules fixture outside of Australia. 2018 also saw the very first women’s Varsity Game. Also, in 2018, the Birmingham women’s team took home the Haggis Cup and Birmingham Aussie Rules President Matti Darowski said that he was thrilled at the prospect of a university league. “With a large number of students wanting to try something new every year, I think that promoting the sport at universities is one of the best ways to expand the sport in the UK,” said Darowski. “In recent years we have played Oxford and Cambridge in friendly games several times each year,” said Darowski, “But it never felt like the results mattered that much.